In this day and age, I am rarely taken aback by some of the collaborations that get cooked up in the music biz. Then again, sometimes a collaboration comes along that is so random yet so completely and utterly brilliant. Such is the case with newly minted duo Painted Doll. Painted Doll is the brainchild of the multi-faceted musician Chris Reifert and the also multi-faceted comedian/musician/friend of BV Dave Hill. Both of these dudes carry a helluva lotta real estate on the Klaus Kinski Cultural Relevance Scale. For starters, I have been a huge fan Chris Reifert for decades after he first popped onto my radar as the drummer on Death‘s debut death metal crusher Scream Bloody Gore, making him one of the true godfathers of the death metal genre as we know it. Following his stint with Death, Reifert went on to form legendary death metal act Autopsy (whose critical 1991 release Mental Funeral still gets plenty of play in my house). He was also founding member of the great Abscess and for decades has been busy with many side-projects, including The Ravenous, Doomed, Eat My Fuk, Violation Wound, and so many other one-offs and guest spots. Dave Hill is also no stranger to music. In addition to being a comedian, Dave is consummate guitar shredder who has been in bands like Valley Lodge, Cobra Verde, and Sons of Elvis. 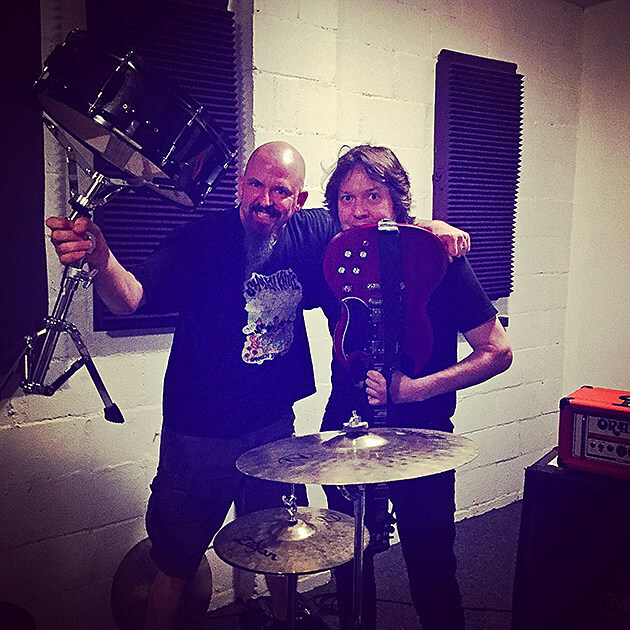 He has played with the likes of Walter Schreifels, Lucy Wainright Roche, and Diamondsnake and even did a web series with Pantera’s Phil Anselmo. Both of these guys have deep musical pedigree. It kind of started after Chris and I began trying to out-deep cut each other with late 60s/early 70s Dutch and British psych pop stuff. Then Chris suggested we form a band inspired by the stuff we’d been trading. We met a year ago in San Antonio at an Autopsy show, practiced four times together, and recorded all the music on the album in three days, then did vocals after. So it was fast! You can hear two tracks below, though there are more to come for sure. The band is currently just Dave and Chris, separated by many many miles, but the hope is that they’ll get set up with a sweet label deal, put together a solid backline, hit the road, and melt faces.